Having ports with commercial and cultural contacts with Europe (especially France), New Orleans, and Cuba, the Yucatecans were easily influenced by many aspects of these countries, such as dress, architecture and cooking, which explains why there is a lot of European flair in its cuisine. Chicken marinated in achiote (annatto), sour orange juice, peppercorns, garlic, cumin, salt, and then wrapped in banana leaves and baked. This dish can also be made with pork (cochinita pibil). A dish you should definitely try for lunch or dinner. Not spicy. Pre-cooked tortilla with shredded chicken and garnished with lettuce and onion. The difference between panuchos and salbutes is that the first has refried beans inside the tortilla. 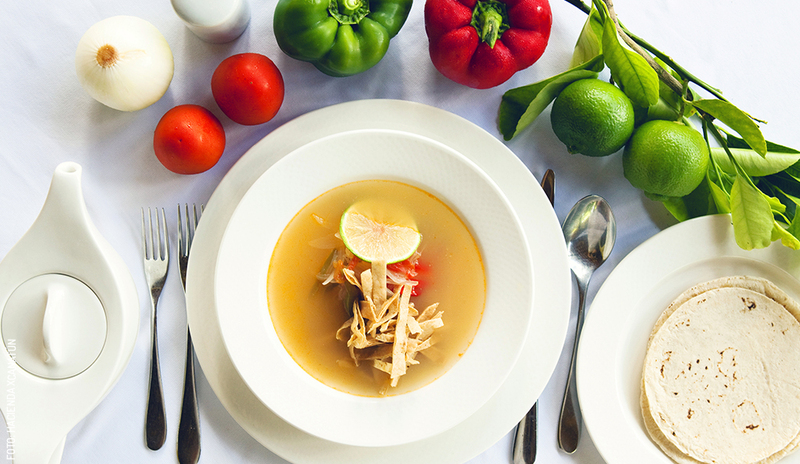 A delicious soup made with shredded chicken, bits of fried tortilla, and lime juice. Exquisite! And very good for you if you aren’t feeling well. 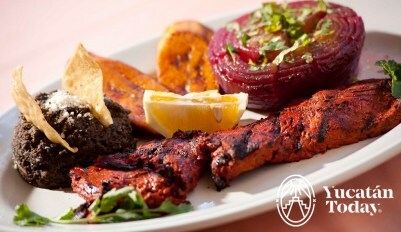 Tender slices of pork marinated in sour orange juice, grilled, and served with a tangy sauce and pickled onions. Some restaurants offer a chicken version. Chopped hard boiled egg rolled up in tortilla and covered with pumpkin seed sauce. The Yucatecan version of pork and beans. Chunks of pork cooked with black beans, served with rice, and garnished with radish, cilantro and onion. A regular Monday dish in most Yucatecan homes. 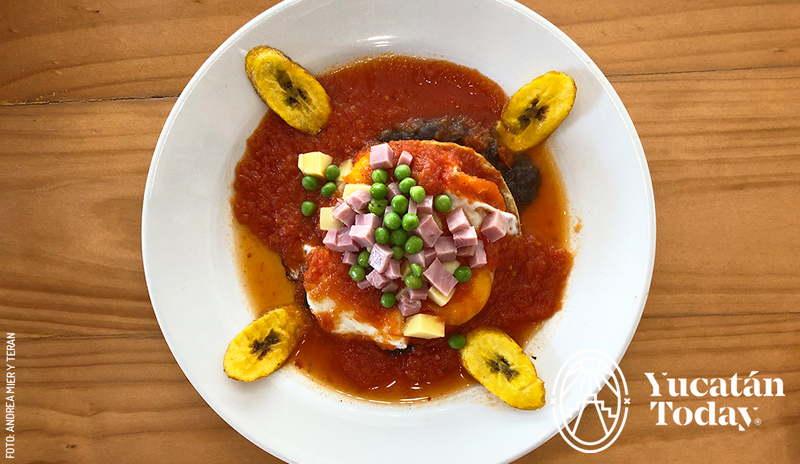 A scrumptious breakfast of tortilla, covered with refried beans and a fried egg and then smothered with tomato sauce, peas, chopped ham and shredded cheese. Usually served with some fried banana slices. Okay, this isn’t food…it’s a beer. You’ll see it on the menu and wonder what it is. Michelada roughly translates as “my cold beer”. The spicy concoction is a beer with lime and peppery seasoning. The ingredients are lime, coarse salt, Worcestershire sauce, soy sauce, Tabasco sauce, black pepper, Maggi seasoning, and beer, preferably a dark Mexican beer like Negra Modelo. Another option is a CHELADA, which is a Michelada without the Tabasco, soy, pepper and other seasonings. It’s just beer, lime, and salt. Poblano chilis are stuffed with either cheese or ground beef and pork, raisins, capers and olives, then coated in a batter, fried, and served with a tomato sauce on top. This is Mexican cuisine’s gourmet haute-cuisine dish, a fancy upscale cousin to Chiles Rellenos. Poblano chiles are stuffed with ground beef and pork, raisins, onion, garlic, peaches, apples, pear and crystallized orange and covered with a walnut sauce and pomegranate seeds. Often translated as cowboy bean soup, this is a red bean soup with diced ham, sausage, tomatoes and onion. Served separately are chopped onions, lime wedges and cilantro that you can add as you please. Often translated as cheese fondue or melted cheese, this cheese dish is not as soupy as traditional fondue. 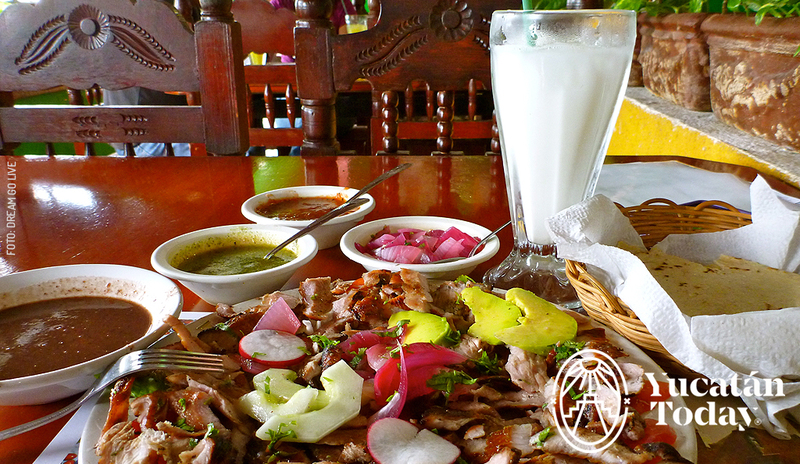 A stringy Oaxaca cheese is melted in a ceramic bowl and served with tortillas. To eat it, rip the tortilla in ½ or ¼, take your fork, twirl some cheese around it then place it in the tortilla. Queso fundido adds-ons include mushrooms, poblano chiles (spicy-ish), chorizo sausage, cactus, or diced meat. The sauce in this savory dish is made from 17 different ingredients that are ground up and blended. Ingredients include : mulato chiles, pasilla chiles, ancho chiles,, Mexican chocolate, peanuts, garlic, black pepper, cinnamon, raisins, cloves, peppercorns, almonds, anise seeds, coriander seeds, pumpkin seeds, and sesame seeds. The sauce is served over either chicken or pork and is wonderful. While not a spicy hot dish, spiciness depends on the chiles. 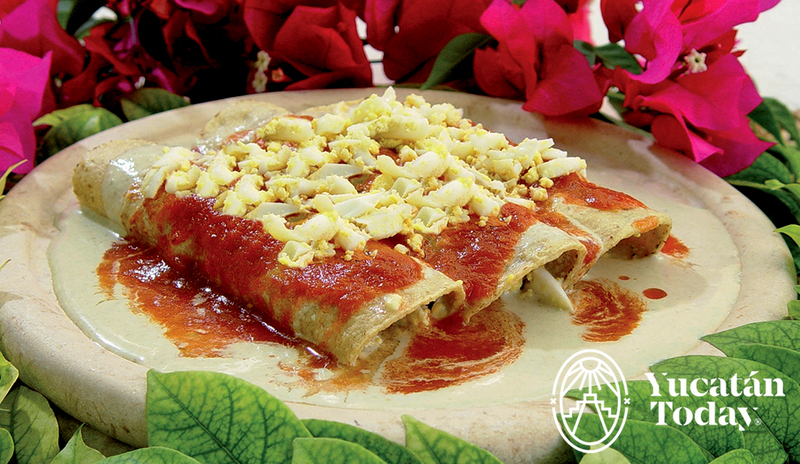 This traditional snack dish is one of Mexico’s claims to fame. Mix chunky avocado, chopped onion, cilantro, salt, some lime juice and possibly chopped tomato. Serve with tortilla chips. If you make it ahead of time, don’t put it in the fridge- that way it won’t turn dark. There are many versions of and ways to make enchiladas, but the basics are made with corn tortillas dipped in the chosen enchilada sauce (to soften), which can be mole, green tomato sauce, etc. then stuffed with chicken or meat, rolled up, placed in a casserole dish, then layered with sauce and cheese and cream and topped with chopped onions or crumbled white cheese. This dish is popular at breakfast. Corn tortillas are cut in strips or triangles, fried in cooking oil, then topped with a red tomato or green tomato sauce then layered casserole style. Cream is drizzled on top. Shredded chicken can be added. Want to learn how to cook Yucatecan food? 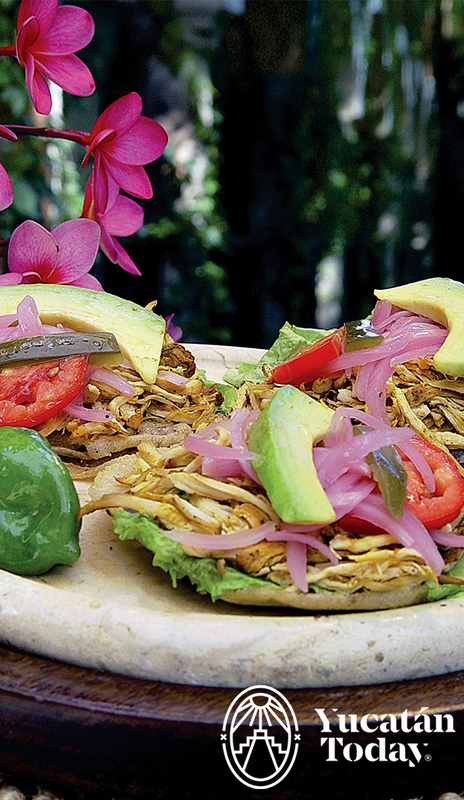 Find a restaurant with Yucatecan food here. Is there any chef or catering service or can you please inform me about any typical restaurant open for the chritmas evening Dec 24 2016.